In my line of work, there are two kinds of people: the ones who can answer my questions, and the ones who won’t be telling us anything any more. Over time I have become deeply attached to many of the people whose traces I stumble across in our archives, even though I will never meet them. There’s a long list of people I wish I could have talked with, people who could have explained things that will instead always remain slightly mysterious no matter how much research I do. Some of these people are the obvious suspects–George Brown, Ken Pitzer, Harry Wiess–but others are less well known. At the top my my list is Zevi Salsburg. Salsburg earned his Ph.D in 1953 at Yale, where he was a member of the influential John Kirkwood group in statistical mechanics. He came to Rice in 1954 as a member of the chemistry department, later holding an appointment in mathematical science as well. He was widely regarded at the time as one of the most brilliant men on campus–he published extensively in chemical physics, held fellowships from NSF, the National Research Council, and the Guggenheim Foundation, and consulted for both Los Alamos and the Lawrence Radiation Lab at Livermore. Salsburg was also a key contributor, as a fund-raiser and designer, of the R1 computer that was built by Rice faculty in Abercrombie lab. It was Salsburg’s need for a machine that could simulate fluid flow that led to the project in the first place. But there was more to Salsburg than his intellectual work. He was a committed citizen of the university who served as an associate at Will Rice and as a member of the faculty advisory committee for the presidential search in 1968-69. He also seems to have been a gentle fellow and a man of compassion for others. Quietly and diligently, on his own, he raised scholarship money for poor and minority students and then went out on the road to find students who could benefit from those scholarships. He supported many of those same students once they were on campus, tutoring them in math and science. Zevi Salsburg died unexpectedly in 1970. It was summer, and he was visiting his parents in California. He was 41 years old. The photograph above was taken in 1963. 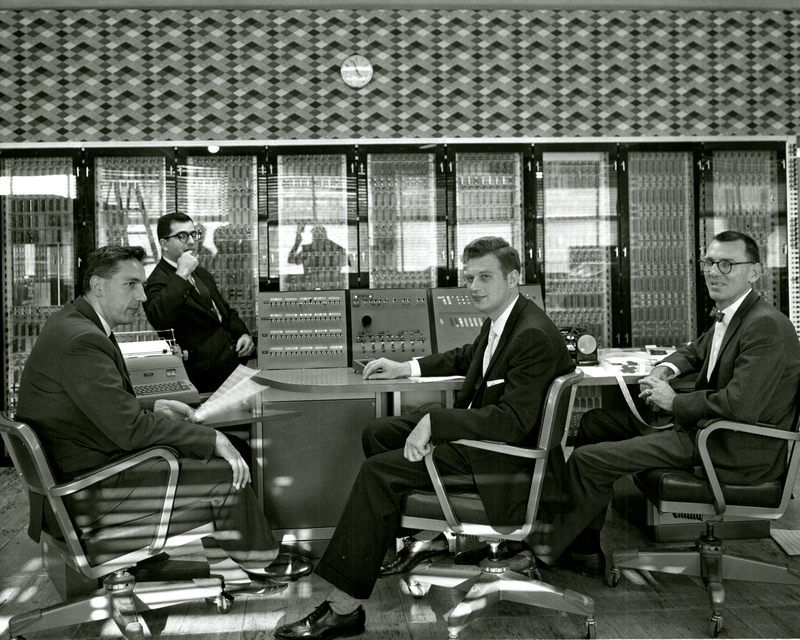 It shows Salsburg, third from the right, along with John Iliffe, Martin Graham, and John Kilpatrick in front of the R1 computer. We have several of the computer panels in the Woodson Research Center, as well as one of the platters from the hard disk. It’s about three feet across and weighs twenty pounds. An excellent short history of the R1 can be found here. As an aspiring historian myself, I always wish I could talk to some of the people who were actually there to witness what we write about. It makes me wonder if I am getting it right, especially with my current project. Great blog, by the way. I am really enjoying it! Thanks, Kaleb. I’m really enjoying this too. Zevi Salsburg was my father’s (John Kilpatrick) close collaborator and best friend. I remember him and his family well. Zevi and his wife Bertha could not have children themselves, so they adopted a son and a daughter. I recall how excited they were both times. It was with Zevi’s encouragement that my father got a Gugenheim Fellowship and worked at the University of Leiden for a semester in 1958, which incidentally meant that I started school in Holland and had to learn to speak Dutch fast, easy enough at that age. The R1 was a source of tremendous pride for my father, Zevi, Martin Graham, and the others who made it happen. When it was finally completed, there was a large and very, by a small child;’s standards, glamorous party to celebrate at our house. When pocket calculators came out in the 70s, my father would compare their size and computing capabilities with great wonder to the power of the R1. Yes, the pocket devices were faster by far, and of course amazingly small, but they, and later early desktops, still could not compare to the R1. That was a machine with real language! Zevi developed intermittent tachycardia, a condition largely untreatable at the time. One episode occurred on a city bus, which took him to the emergency room. The story was on the front page of the Houston Chronicle. He, his family, and his friends knew from this time forward that he has a possibly fatal condition. Yet, his death still came as a terrible shock. I believe my father missed Zevi until the day he died, 25 years later. After her husband died, Bertha returned to school and remained very active in the Rice community until she also died at much too young an age. Thanks so much for this comment. We really have very little information about him in the files, and there’s nothing in the newspaper obits about what happened to him. You’ve solved that mystery. One thing that comes through really clearly in documents from the era is how shocked everyone was at his death. There was a really powerful sense of loss and sorrow. He seems to have been regarded as a truly special individual. Again, thanks. I really appreciate hearing from you. I knew both Zevi and his wife Bertha very well. He and I along with Bob Curl were members of the same car pool in the late fifties and early sixties. As a new faculty member I held Zevi to be one of the smartest people I knew. I loved him as a colleague and continue to miss his inspiration. We could talk about him sometime if you are interested. Thank you so much for taking time out to meet with me and my family and to share your passion for my dad’s work and his contribution to Rice. I am eager to dig into my photos and films and will gladly share what I have with you and the university. Growing up as part of the Rice family gave me a wonderful childhood and provided me with many, many fun memories. Alot of them came flooding back as we walked thru the canopies of trees on campus. My dad may have been an important man on campus, but he was a more important man at home. He and I were very close and he was an incredible father. My love of reading came from many hours of sitting in the big grey chair having stories read and told to me by him. I loved him very much. Although they have both been gone for a long time, I miss my parents very much but feel that they are always with me and that their legacy lives on. We look forward to meeting with you again soon! I was 14 and standing next to my father in the breakfast room when he took the phone call informing him of Zevi Salsburg’s death. I never saw him more shaken before or after. He was absolutely crushed by the news. He said, “That’s the worst news I’ve heard in a very long time.” I couldn’t imagine what had happened; he was normally very stoic. He was deeply attached to his friend. first off i would like to thank everybody for all the kind words about my father zevi walter salsburg.i know everyone that knew him misses him greatly.i was there in calif when he passed on and i really miss him alot still.i would like to take this time to remember all the times i had with him and all the people i got to meet at rice university.ican remember as young child going to rice helping out in the chemistry labs learning about a lot of different things,like not to hold dry ice for very long.i will be here from time to time ,so take care. My husband, Lincoln Durst, was a math professor at Rice and good friend of Zevi’s and Bertha. Apart from remembering the shock of his death, I do remember a couple of other things. – Zevi’s dad had been a kosher butcher. Zevi knew how to identify a good chicken and taught me to cut it up. To this day, I think of him when I cut one up. – Zevi and Bertha kept a kosher kitchen so their parents would feel comfortable visiting with them. They somehow managed to convince their rabbi that melamine was like glass, hence kosher, hence not needing to be segregated for Passover use. I thought that was ingenious!